Ang Huling El Bimbo the musical is ongoing until September 2, 2018 at the Newport Performing Arts Theater, Resorts World Manila. 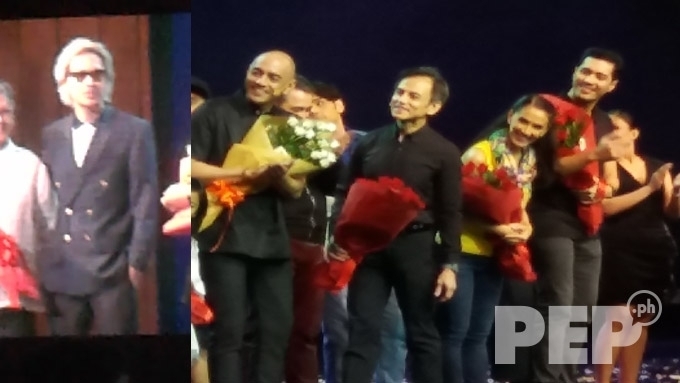 Ely Buendia (left frame) graced the gala night of the play. Whether you are a die-hard fan or simply familiar with Eraserheads songs, watching Ang Huling El Bimbo the musical is a “fine time” spent. You can never go wrong with the greatest Filipino band discography arranged and rendered by a topnotch pop orchestra and emphatically sung in professional vocal theatrics by a set of characters breathing through their affectionate lyrics and infectious melodies. Simply put, it is a grand, conceptually tight, and well-deserved tribute to a musical act whose influence on modern Filipino culture and arts is arguably second to none. Ang Huling El Bimbo shows the bittersweet tale of three friends whose lives were drastically changed while studying in a university. The play starts by showing Gian Magdangal as the older Hector, Jon Santos as the older Anthony, and OJ Mariano as the older Emman. They have been summoned to a precint with regards to the tragic fate of their friend Joy (played by Tanya Manalang). Through flashback sequences, theatergoers get to see how the beginnings of the friendship of the rich kid Hector (Reb Atadero), the probinsyano scholar Emman (Boo Gabunada), and the closeted homosexual Anthony (Topper Fabregas). There are plenty of references to the University of the Philippines in Diliman — where members of the Eraserheads studied — particularly Kalayaan Hall, the U.P. Fair and the Oblation run. Ang Huling El Bimbo the musical is being staged until September 2 at the Newport Performing Arts Theater in Resorts World Manila. While it is expected many of their most popular tracks are featured in this original Filipino production, which it does, it is hearing the non-singles or relatively minor hits (or those only known to avid fans who may have collected all cassette tapes bearing Eraserheads album titles) that make the play’s repertoire appearing superbly- thought and intelligently treated. The opening scene sees tenor OJ Mariano, as Emman, singing the first lines of “Poor Man’s Grave,” kicking off a string of tunes to set off the mood, all taken from the band’s biggest-selling album Cutterpillow. Yes, the singles off that one are all in the plot, including of course, the musical’s titular piece. But hearing songs like “Paru- Parong Ningning,” “Slo Mo”, “Fill Her” and “Waiting for the Bus” creates the impression that the team behind this theater spectacle produced by Resorts World Manila and Full House Theater Company (in cooperation with Ultimate Shows, Inc.) is one truly immersed in Eraserheads catalogue. UNHERALDED SONGS IN A NEW LIGHT. Those moments heighten the universality of Eraserheads songs, or at least within the cinematic universe of Filipinos. One track interestingly showcased is “Tama Ka Nga”, with its heartwarming lines “Walang saysay kung itutuloy pa/Hayaan na natin ang bukas.” Oddly, it’s an obscure piece from the all-Tagalog collection Natin 99 and composed, lead-sung by, yes, bassist Buddy Zabala. But upon hearing it delivered as backdrop to state-of-the-art set design and to uplift someone’s spirit, the song is taken to a more meaningful light. Another oddball given spotlight is “Sino Sa Atin,” written and sung by drummer Raimund Marasigan in Eraserheads anthology. Repetition of the lines “Anong nangyari dito/Sino sa atin ang nagbago” in one intense sequence should make some '90s babies take a look back at some Eraserheads album tracks not voiced or written by frontman and chief songwriter Ely Buendia. It’s almost hard to believe that portions of songs like “May Sumasayaw”, “Saturn Return,” and “Light Years” are given exposure over other more recognizable words from the trend-setting band’s canon. But these are clearly picked as needed in the story, which in so doing makes the tale organic and seamlessly embraced to the brand that is Eraserheads. EXTRA CLASS BEYOND MASS APPEAL. For not sticking mainly to the group’s greatest hits to keep up with general listeners and extracting less-known but equally powerful songs to push the narrative, the depth of the whole work is taken up ashore. The musical’s synopsis says that the story “unfolds in two timelines with a series of flashbacks and scenes from the present interwoven to tell the tale of a friendship shattered into a thousand pieces.” That description is better understood by seeing it in front of your eyes with all the carefully crafted visuals, and hearing several important OPM alt-rock songs brilliantly arranged, played live first-rate, and sweepingly weaved into the dialogue. The musical direction of Myke Salomon and the effort of Manila Philharmonic Orchestra both deserve the applause (like the one heard to introduce the hidden title track in “Cutterpillow” that opens with “I used to have a cat).” Theirs are tasks as difficult as ranking the Top 20 Eraserheads songs and ensuring you won’t be criticized by music analysts or true blue Eheads fans. The overall treatment succeeds in giving Eraserheads music some extra class beyond what their mass-empowering records quickly offer. The casting, too, is right for the project as it does not try to overshadow the colossal catalogue it is paying homage to. Boy these thespians “rise and shine” to the occasion, like Topper Fabregas, playing the young Anthony who delivers happy and gay punchlines almost without effort, or Reb Atadero (in the role of the young Hector) who employs strong chemistry with Tanya Manalang’s lead female character Joy through well-timed dead air. There’s a mention of a girl going to Canada (“Tindahan Ni Aling Nena”), the use of the expression “surely” which of course segues to “Shirley,” and a '90s-style sedan prop as if it is the one that breaks down or won’t start at the end of “Overdrive” and before Marcus begins his peculiar menu wish list.